Constanta is positioned in the Dobrogea region, which is located in the south-east of Romania. Around the city is an important metropolitan area which makes Constanta the third largest city in Romania, after Bucharest and Cluj-Napoca. 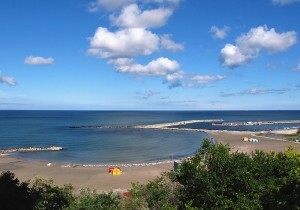 Constanta is set on the Black Sea coast and has 13km long beach. 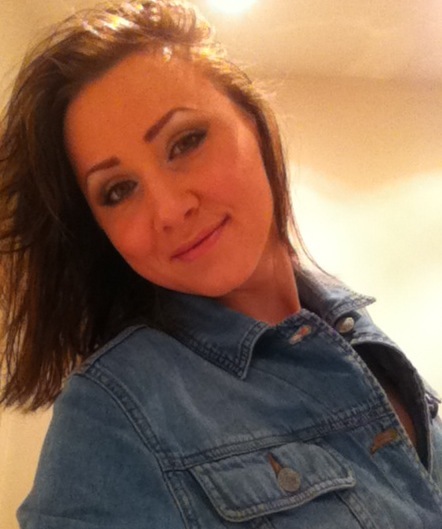 I was born in Constanta, Romania and it is where I grew up and spent all of my childhood as well. This means Constanta holds a lot of beautiful memories for me — since I spent a large part of my life there. It’s a wonderful place to visit especially in the summer, as it has the Black Sea with its beautiful beach resorts. One of the most widely known beach resorts in Constanta is Mamaia, located in the north edge of the town. In my opinion this is the best beach resort in Romania – especially if you are young and looking for some fun. Mamaia is an administrative district of Constanta and it’s the most modern resort on the Romanian coast. It is sunny all day due to it’s 7km long beach which faces east. I think my favorite thing about Constanta is the sea with its lovely beaches. I love how full of life it is in the summer when tourists from all over Romania and abroad come to enjoy its beauty. 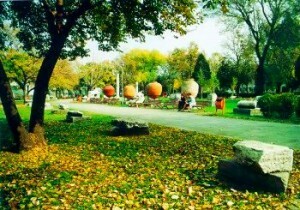 Constanta is particular warm with 4 distinct seasons during the year. My favorite season is summer, when the weather is perfect for enjoying outside activities, going to the beach and taking advantage of everything the city has to offer. Summer starts in late May and it lasts until September though the highest temperatures are in July (the month in which my B-day is) and August when there are average temperatures of 25 °C. Autumn starts gradually with warm and sunny days giving people time to accept the ending of summer. It happened sometimes for September to be as warm and nice as June making rain a surprise when it finally occurred. So it is best to carry an umbrella in September. From personal experience, it could rain quite a lot in this month. The winter does not bring plenty of snow though it is pretty windy and the average temperatures in December are 0 °C – 1 °C. 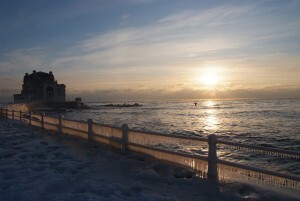 Compared to other regions in Romania, Constanta has usually a mild type of winter. Though the climate changes that lately started to affect all our planet, transformed Constanta`s winters into harsher ones. In the last 2 years (2011 and 2012) winter brought to Constanta (and not only as it affected all Romania) a lot of snow and cold, even freezing the Sea. When spring arrives it is a delight as everyone is anxious for the weather to get warmer and warmer. March is the month that usually brings spring. The first flowers shyly appear, such as teardrops, at the surface through the melting snow. The average temperatures in March are 8 °C. 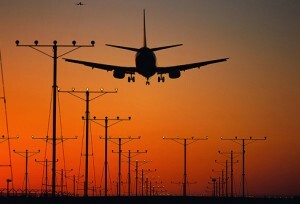 26 km (15 miles) from Constanta is the Mihail Kogalniceanu International Airport. This is the main airport for Dobrogea — the region where Constanta is located — and it offers access to the Constanta County and to all of the Black Sea Romanian Resorts. This airport it`s not as big as the main international airport in Bucharest. When it comes to traveling by train, there are no reasons to worry as daily routes cover the connections to all the major cities in Romania. Between Constanta and Bucharest there is a daily Intercity (Express) service and the journey between these them is approximately 4 hours. In the summer time there are quite a few daily trains every half-hour that connect Constanta to all the Black Sea resorts. Though tickets for same-day travel can only be purchased at the station. 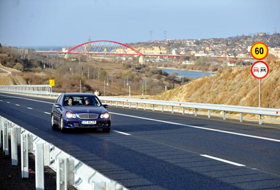 If you are traveling from Bucharest to Constanta, the, most popular and recommended route would be The Sun Motorway (as it is called) or also known as A2 motorway. The distance between Bucharest and Constanta on this motorway is 202 km. This is a new highway that opened in November 2012 cutting journey times in Romania. Constanta`s Harbour is the finishing point for voyage ships and private boats via the Bosphorus Strait or the Danube River. Tickets can be purchased at cubicles displaying the RATC logo found in the stations. The price of a ticket is about £0.69. Make sure you stamp your ticket when you board. When it comes to choosing a taxi, it is better knowing which company is trust worthy. This way you will avoid any independent cab driver that might not go by the legal rules and overcharge you. Maxi Taxi are mini-buses that are covering all the area of Constanta. In the summer some of the mini buses go to Mamaia resort as well. 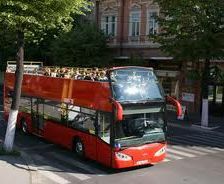 This is another way of transportation but is mainly destined for tourists as the buses assigned have a particular route through Constanta. 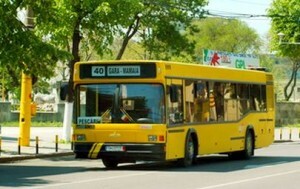 Buses that make the tour of Constanta are available only during the summer season. Tickets for Constanta City Tour can only be purchased on boarding and the cost is about £ 0.79. Constanta has a beach called Modern which is only 5 minutes away from the center. 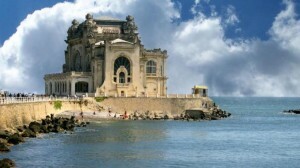 Though for a richer experience on Constanta`s beaches the best way is heading to the resorts along the Black Sea coast. Constanta has the largest port in the Black Sea and the fourth most important in Europe spread over an area of 3182 ha (land & water). Each day more than 200 ships are in the port loading and unloading goods or waiting to be operated. The strongest feature of Constanta’s Harbour is the connection that it has with the Danube river made through the Danube – Black Sea Canal. You won’t have trouble in finding a hotel in Constanta or its closest resort, Mamaia. Being a popular tourist resort means there is a wide range of options when it comes to accommodation. Hostels and hotels are spread throughout Constanta and along Mamaia resort as well. Depending on your preferences, there are affordable and luxury hotels from which to choose. Most hotels have their own parking space and of course internet access or wi-fi. The staff will speak English, as this is a very well-known language among people from Romania, especially employees of hostels and hotels. There are many locations in Constanta where you can shop for all sorts of things: starting with food to clothing and accessories. There is a wide diversity and though a few years back, the center of Constanta was the most frequented for shopping, nowadays there are a couple of shopping centers in other areas. These places are well known in Constanta for their varied range of options when it comes to nice clothing items, jewellery and accessories. 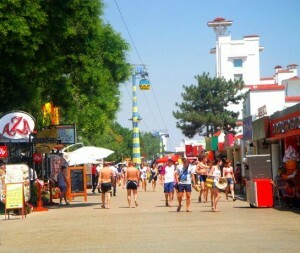 Another place where you can shop for lovely and cute things is Mamaia resort, but only during the summer. If you like to enjoy a nice long walk along Mamaia Resort, you will be surprised of how many shops and kiosks you will find packed with all types of stuff. Constanta was first founded under the name of Tomis following the Greek colonisation of Pontus Euxinus by Greek colonists from Miletus in VII-V century BC. That makes Constanta the oldest town in Romania. The city`s past was revealed by documents dating from 657 BC. In that time a Greek colony was occupying Tomis, known today as Constanta. Back then there were frequent battles for conquering one piece of land. So the settlement was conquered by the Romans in 71 BC and renamed Constantiana after the sister of Constantine the Great. During the 13th century, Italian merchants from Genoa took over The Great Sea (as The Black Sea was called then) and actually helped develop the city. Those circumstances didn’t last much though, as subsequently, the Ottoman Empire occupied Constanta. During their sovereignty reached decay, as it became a simple fishing village inhabited by Greeks and Tatars breeders of horses and sheep. This land`s location regained its city status and high importance, after Cernavoda-Constanta Railway was built in 1865 along with the Port which facilitated the Romanian grain exports. Only after the War of Independence (1877-1878) Dobrogea region became part of Romania`s Kingdom and remained that way until nowadays, increasing its role constantly, as part of the country. Can I get a taxi from Constanta airport to Neptun on 27/05/17 at 21.20 hours.